Located in the heart of Bangalore city, the GEMS B-School has always been a strong advocate of practice-based learning and skill development. With the addition of Bachelor's in Hotel Management, a three-year degree programme under the banner GEMS Hotel Management Institute, the management of the institute has taken its teaching methods to a completely new level. It is a first of its kind concept where a Hotel Management Institute operates out of a Hotel. "From the day one, we will put our students on a paid Internship where they will 'Work and Study' in our own Resort, Fiestaa Resort n Events Venue," says Kunal Nehruji, Executive Director, GEMS B School. Professionally managed by the GEMS Hotel Management Institute, Fiestaa Resort n Events Venue located near Bangalore International Airport, is a highly rated resort and Events Venue. While many newly established hotel management institutes in the country are struggling to find a place for their students to undergo practical learning, the decision of GEMS to provide hospitality education in a real work environment needs a lot of appreciation. "GEMS HMI through its association with Fiestaa aims to fulfill the career dreams of the youngsters in the same by giving ample experience within the course duration," states Kunal Nehruji, Executive Director, GEMS B School. From the day one of the course, students are provided learning with the right blend of practicals with the theory sessions. "In our training methodology, 70 percent of the learning happens through practical sessions and the 30 percent with theoretical classes. The students will get to work in various departments like front office, housekeeping, food and beverages service, Inventory Management, event management and also does outdoor catering (ODC)," pinpoints Kunal. While many newly established hotel management institutes in the country are struggling to find a place for their students to undergo practical learning, the decision of GEMS to provide hospitality education in a real work environment needs a lot of appreciation. In the first six months, the institute lays its focus on communication, leadership, business etiquette, work ethics, stress and time management along with physical fitness. Simultaneously, learning at the same is assessed through the real-time sessions at the Fiestaa. "In a day, students are trained in the classroom for three hours and the rest of the time is spent working at Fiestaa. This real-life learning and the working with the hotel creates a confidence in them," opines Kunal. The institute follows a unique strategy of 'learn - earn - learn' method wherein in the three years, along with the real-life experience attained through Fiestaa, the students are rewarded for their work with stipends. 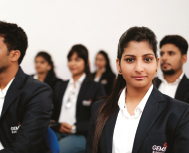 The management of GEMS claims that no university or college in India offers such a unique and comprehensive program in the hospitality sector. As hotel management is all about handling new challenges every day, getting a firsthand exposure to various functions in the hotel industry right in front of guests is an advantage. At the time of real-life practical sessions at Fiestaa, these students need to handle some challenging situations and we do believe that the real-reates a total transformation in the students making them mature enough to handle the situations. "Though we started this program the last year, we assure the quality of the graduates as they fulfill the experience requirement," claims Kunal. Hence, through this logically set training pattern, the students get to learn the think-analyze and act method in dealing with the guests. Further, the top-notch professionals also handhold and guide these young minds in every step. As GEMS HMI continues its journey, the institute is trying to render the students with options for international exposure. "We have a proposal for imparting few months training in a foreign country so as to widen their number of career opportunities," concludes Kunal. With time, the institute will be adding more effective and influential elements making the teaching process robust expanding the learning options.